Published: Aug. 15, 2017 at 10:14 a.m.
Lamar Jackson took the college football world by storm in 2016, becoming the youngest player ever to win the Heisman Trophy. An explosive dual threat, Jackson threw for 3,543 yards and 30 touchdowns. He rushed for 1,571 yards and 21 scores (both ACC records). Comparisons to Mike Vick came rolling in soon after his hot start to the season, and Vick fully endorsed the buzz. Now, Jackson returns as the most exciting player in CFB, and aims to become the second player in history to win the Heisman twice. For scouts with questions about how his game will translate to the next level, the 2017 campaign should offer more insight. Jackson will be under center more frequently in an offense more closely resembling a pro-style one, per Louisville coach Bobby Petrino. Jackson received votes from all seven CFB 24/7 experts, including a No. 1 vote and two other top-3 votes. 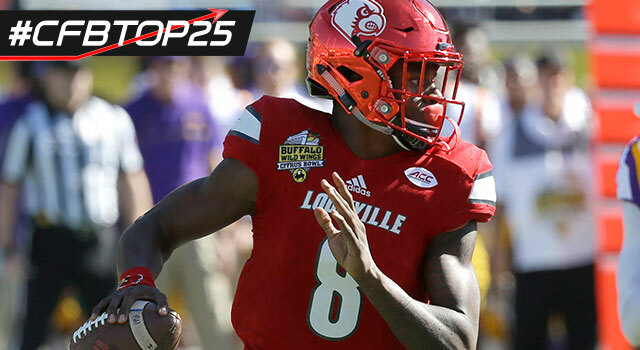 Two QBs finished ahead of him in the #CFBTop25 countdown. Where do fans rank Jackson? We asked Twitter users who they considered the best player in college football. Jackson received enough support to finish third in the voting (second among QBs to Oklahoma's Baker Mayfield). Of course, it's no surprise Jackson finished so high. While he hasn't received as much offseason buzz as some of his fellow QB prospects, he's one of the game's biggest stars.